Inspired by the natural environment, workshop participants explore and develop their own creativity, immersed in techniques and practices developed at Moon Rain Centre that demystify tapestry weaving, making it accessible to everyone. 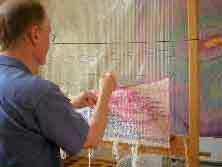 This weekend workshop is an introduction to the art and craft of tapestry weaving. 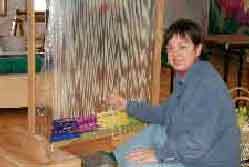 Basic techniques are explored and practiced on small frame looms. 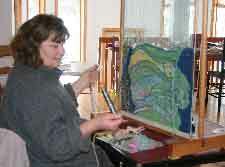 While learning to blend colours and build woven shapes and lines, participants create a small tapestry to take home. During this week workshop, the patterns of nature inspire woven tapestries, as each participant explores in depth the tapestry weaving process, developing and weaving a visual idea into a finished tapestry. Mentoring responds to the unique questions and concerns of individual advanced students. 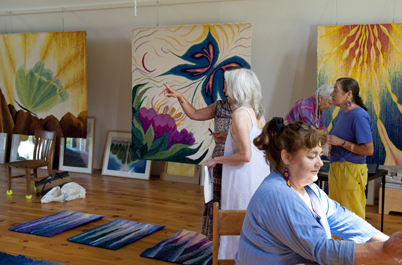 Emerging tapestry weavers are shown how to recognize and develop their own unique creative gifts, while learning to become active creative members of their own communities. Weaving transmits the energy of Peace. It has a calming, harmonizing effect on people, especially on children, so is an excellent tool for today’s classrooms and community centers. This workshop teaches simple creative weaving skills and projects that are suitable for all ages, abilities, and cultural programming budgets. In this workshop participants learn how to turn the family ragbin into woven fabric art projects, how to make simple frame looms and weave on them, how to make cloth looms and more.